Courtesy of Integrity Engineering, Inc.
Project Description: Having been granted a U.S. Utility Patent for a new chemical-reduction process to recycle expanded polystyrene, the company engaged an out of state firm to build a pre-production machine to pilot test and prove their technology. Due to a dispute subsequent to delivery, the fabricator withheld all design documents, making full understanding of the process and operation of the complex machinery extremely difficult. The client tried for several months to operate the machine, but numerous equipment problems developed, resulting in lackluster performance and poor process quality. We were asked to help. We immediately recognized that the first step we needed to take was to obtain and digest every document describing the new recycling process. 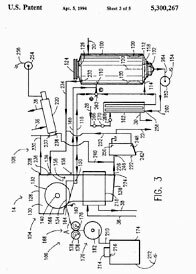 These were very limited, consisting mainly of the inventors’ U.S. Utility Patent and past notes, including the desired throughput parameters that were given to the machine’s constructor. Subsequently we systematically subdivided the process into manageable sub-systems, and installed instrumentation onto the equipment and process piping. We calculated preliminary mass and energy balances and developed sub-system process flow diagrams. We then energized each sub-system and performed trial runs. This established transient and steady state operating characteristics, which we compared to the performance values we had calculated. Numerous equipment, control and instrumentation problems were identified during these many performance trials; all were corrected. Several sub-systems were grossly oversized, while others were greatly undersized. Piping had to be reconfigured and resized to accommodate increased volumes. The combination of offsetting equipment performance established the constraints of the entire machine and its capacity. With these constraining limits firmly established, we constructed a final mass-energy balance and directed performance trials to fine-tune the machinery. Being complex, these trials extended for a period of several weeks. At the completion of our effort, significant improvements to the process and in the machinery were made, resulting in far greater product quality at more than a 5x increase in product quantity. No comments were found for Reverse Engineering of EPS Recycling Process - Case Study. Be the first to comment!